The shellfire suddenly breaks off. I get up and position myself in the loader’s hatch to have a look. As far as I can see, they’re not shooting at us any more, but the front rumbles away. The enemy offensive is in full swing… Over there, across the crest of the slope opposite us, the enemy appears: Russian infantry. As far as the eye can see, to left and right, they occupy the entire crest, followed by a second wave. We really didn’t see them. The company commander radios: ‘Hold your fire.’ We couldn’t do anything anyway, the range is too great, I estimate it to be about 3,000 metres. The attack waves are about 50 metres apart. Now and then a shell flies over, but lands in front of us in the fields, to the right or left. We concentrate on counting the Red Army’s attack waves. There are now seven, eight, nine, now twelve. Thousands of Russians pour forward endlessly, there must be a whole infantry division committed against us. Our eyes flicker along the horizon to left and right; no tanks, no anti-tank guns in sight. Then we hear the ‘Urrah!’The east wind carries it from the other slope to us. The first waves have already almost reached the bottom of the valley, and we can no longer see them beyond the curve of the slope. There is a continuous ‘Urrah’- to the front, to the left, to the right. We are uneasy. We aren’t able to shoot at what we can see. They are too far away, it would only reveal our positions. Actually, we are in a good position in our sandy hollow, with only the gun protruding forward and the turret above the top of the hollow. Then it all begins again. The twelfth wave is the last that I see, then I pull myself back inside and quickly close the hatch. There is a further heavy firestrike by the Russian artillery. We are plastered with fire. A 152mm shell detonates a metre from the edge of our pit, hurling earth over the tank, sand flies over the cupola; Sattler has already pulled his head in. Now there’s pandemonium. Just get us out of this hole. Sattler orders, ‘Start the engine,’ and Richard Braumandl shouts, ‘Herr Feldwebel, I know!’ As the tank digs itself out of the sand and moves backwards, our stern points into the air, and everyone fears that if we take an artillery hit, we may flip right over. We drive back out of the pit with our engine howling. The Red Army, too, was running out of experienced soldiers. The poorly trained replacements included many of the men from the newly liberated areas of the western Soviet Union. All that could be done with such infantry was to attack in great waves, reminiscent of World War I. It was fortunate for them that the Germans lacked sufficient artillery and infantry to smash such easy targets. The Russian artillery’s salvoes keep coming, four shells at a time. Right and left of us, the shells explode amongst the houses. Glancing back past the house behind us, I see our infantry running along the road beyond. They are coming from the right. Sattler sees them too, and I ask myself, who’s protecting our right flank? Have we any right flank security at all? The situation isn’t clear to us here, between the houses, amongst the farmers’ gardens. Is 7 Company on our right? Sattler asks via the radio. The right flank is covered, comes the reply from the chief’s vehicle. Two of our tanks are being sent there. The Russian artillery fires continuously. Half-left of us, at about 11 o’clock, we can see some of our tanks moving. They are Panthers, clearly recognizable with their triangular rears, and their two exhausts visible at the top. … There, suddenly it happens! Yellow-green tracers fly from the right, a long, poisonous flare behind it! Phosphorus ammunition: I see the shell fly and hit. One of the Panthers is hit on the side of its hull and immediately burns – and how! It blazes like a flare. That was the phosphorus. We know that such ammunition is forbidden under international law, just like explosive bullets. But the Russians use both regardless. All of us have an inner horror of it. So, we are faced by a tank unit with just such ammunition. Phosphorus ammunition was not actually used as an anti-tank weapon, more as a smoke round. Phosphorus elements were also used to create highly visible tracers for shells, and machine-gun belts with every round containing a small phosphorus tracer were used in World War I as incendiary ammunition when engaging hydrogen-filled balloons. As the use of phosphorus rounds in Iraq has demonstrated, the legal status of such ammunition remains controversial. It is likely that on this occasion, Huber was observing conventional armour-piercing rounds fitted with phosphorus tracers. The sloped frontal armour of the Panther tank was 80mm thick, but the side armour was only 45mm, and had a far less generous slope. The 85mm guns of the Soviet T-34s would have had little difficulty penetrating this side-armour. Panthers also had a bad reputation for catching fire, not least because of the poor quality of synthetic rubber that was now used in the manufacture of seals. Crews often complained of the strong smell of petrol within the fighting compartment, and in such circumstances, penetration by a round with a burning phosphorus tracer was likely to be fatal. Huber continued to watch helplessly as two more Panthers were hit and destroyed. A short while later Jakob, the company commander, was wounded in the forehead by artillery shrapnel, and as he sagged unconscious in his seat, blood streaming from the wound, the rest of his crew feared the worst. Leutnant Müller took over command of the company, while Jakob was bandaged and, to the relief of his men, soon regained consciousness. We come to a halt in the garden, from where we see the road. It is a dreadful scene. There are dozens of dead and wounded Landsers [soldiers], as I glance to the left over the turret and right to the north, I estimate at least 100, 200 seriously wounded and dead lying there. We can’t drive over them, we have to look out to drive between the many living, who writhe and cry out in pain. Some of the Katyusha salvoes had struck the 7th Panzer Divisions main field dressing station near the northern end of Luoke. Already overflowing with wounded, the dressing station became a charnel house, and was overrun by the advancing Soviet infantry as the tanks pulled back. 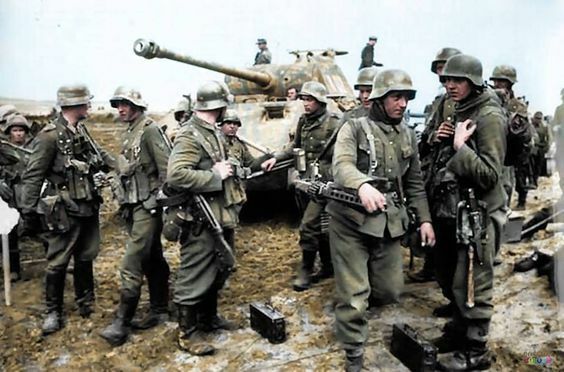 Everyone wants to pull back, the Russians have stormed the southern part of the village; a powerful tank unit must have moved in there, unnoticed by us. We feared as much. To our right, the south, we had no protection. 7 Company wasn’t there to beat off the enemy in good time. Two minutes later, when we are all positioned across the road, ready finally to turn right and descend the hill that we climbed an hour before, an Unteroffizier rises up from the ground. He has been wounded in the belly with shrapnel from a Stalin organ, right through from left to right, sliced right open. He holds his spilled guts with both arms, as if holding a basket, staggers to our tank, wants to climb on, I reach for him, he cries with a pained expression, his eyes full of fear, ‘Comrades, take me with you!’ I want to pull him up over the turret skirting, but he can’t hold on, he doesn’t have the strength. He falls, with a hand to his belly, holding his entrails together, slowly keels over, sits on the road and then pulls himself halfway onto his side. His spilled intestines pour onto the sand. Dreadful. A man falls to his death, trying to reach for his last chance. I couldn’t get hold of his hand, I was left grasping at empty air. Have the Russians bypassed us? Have we failed to notice a pincer attack? These thoughts shoot through my head. I see nothing, but Sattler taps me on the shoulder and tells me to prepare the machine-gun, and then Isecke fires like mad with the turret machine-gun towards 2 o’clock. In the front, Karl also fires one burst after another with the radio-operator’s machine-gun, and outside all hell breaks loose. Then Richard Braumandl shouts, ‘Herr Feldwebel, the tank in front of us, dear God!’ He stamps on the brakes, we all pitch forward, and then we’re off again. I am busy loading the machine-gun. It’s difficult, as the main gun is fully depressed. There is now little space above the machine-gun breech to load the belt. ‘Please don’t jam,’I think. But it works fine. We drive for a long time, with ricochets clicking constantly off the armour. They’re firing at us with everything they have, it must be Russian infantry! If only there aren’t any anti-tank guns nearby. After a good two kilometres, Isecke, the gunner, stops shooting. He raises the main gun again and Sattler says, ‘We’re through now.’ We must have come about two kilometres through the Russian lines. Isecke orders me, ‘Go out and check the turret, it’s jammed.’ We drive on, but much slower. As soon as I climb out of the hatch, I catch my breath. Our tank is empty. As I climb over the turret skirting, I see that only one of our men is still there, clinging by his fingers to the grill of the engine decking and holding on. I stare for a moment, and realise that all of the infantry must have been shot off the back. None of them has survived. When I reach the Landser and try to pull him aboard, I see that he’s unharmed. He is an old soldier, I reckon at least 50, if not 55. Over the noise of the tracks, I shout to him, ‘Where are the others?’ But he can’t say a word. He just crawls forward across the engine decking and says nothing, his teeth chattering as if it were 30 degrees below zero. He’s in shock. But I need to find out what’s jamming the turret. That is not so easy. Finally, over on the gunner’s side, I find an abandoned rifle that has jammed under the outer skirting. I have to work it back and forth to free it, and then I reckon that Isecke will be able to turn the turret. Now we halt. Immediately, we turn the turret to 5 o’clock, so that we can shoot backwards… Now what are we to do with the soldier who lies on his side; he will have to move if we are to shoot. But he is not fit to walk, or jump off. I can see that the man has gone through hell and is the only survivor of perhaps a dozen men. Sattler agrees, we leave him up top, but he must move forward to the nose, where I secure him so that he does not place his feet on the radio-operator’s machine-gun and doesn’t obstruct Richard Braumandl’s observation slit, which would be fatal. He still can’t speak, but he understands. I can see that. About 900 metres away, on the hill in front of us, we hear a shot. Rose-red tracer! Damn, T-34s. So they are already here! Nothing for it but to get back in the tank. The other vehicles in our company have already opened fire, but we can see little of the enemy tanks. Only turrets and cupolas are visible. We can’t hit them beyond the ridge. Isecke also fires twice, then we give up. There’s more going down to our right. 7 Company is over there. Our comrades are more involved in the tank battle than us – but I hear only their tank guns. And then the T-34s must have hit one of 7 Company. The tank burns. It isn’t possible to see who’s been hit. Most, or even all, have to pull back, we hear via the radio. Then we are ordered to withdraw a further two or three kilometres. Once we are in position and evening is drawing on, Richard Braumandl begins to talk. ‘Herr Feldwebel, what tank was that before us, driving in front of us, when we broke out? I wasn’t able to see, as there were so many infantry in the way. You know how we drove down the hill afterwards.’ The Feldwebel doesn’t know. Richard asks again, ‘Did you really not see him? “I didn’t notice – there was too much happening. “Hmmm, what’s Richard getting at?’ I ask him. Then he explains. ‘I only saw the tank in front of me with infantry that the Russians were shooting. But then the tank slipped into the ditch with its right track, and overran a group of our Landsers who were in the ditch taking cover from the Russians, with its right track. It was awful – arms and legs were hanging from the track, torn off by it, it drove over the soldiers for at least 30 metres, our own Landsers.’ The blood drains from the three of us, Sattler says nothing, but he must have seen it too. Dreadful! The driver in front of us was responsible for the deaths of our own comrades – he simply rolled them flat when we broke out of the encirclement. Richard’s words shock everyone. Nobody speaks a word, everyone thinks back about an hour and a half before when Richard shouted, ‘Herr Feldwebel, the driver in front of us, dear God!’ There’s silence in the vehicle, with the only noise coming from the headsets, the sounds of guns firing. Death has done a dreadful business today. Both flanks of the Luoke position had been bypassed. The Soviet forces once more demonstrated their mastery of armoured warfare – avoid and bypass strong positions, and probe for weaknesses. The remaining elements of 7th Panzer Division, Grossdeutschland and 551st Volksgrenadier Division had no choice but to pull back; the alternative was to invite encirclement. Moving northwest from Luoke, one battalion of the Grossdeutschland fusilier regiment ran into enemy spearheads in Seda. As it struggled to check the Soviet advance, some of Grossdeutschland`s assault guns were dispatched to support it. Although the town remained in Soviet hands, a further penetration to the west was prevented, at least for the moment. A decision was then made to pull back the fragmented front to the East Prussian frontier, immediately east of Memel. In the chaos, some elements of Grossdeutschland found themselves cut off by the enemy. The well-armoured Tiger tanks simply held their positions until nightfall, and then broke through to the west. A Panzergrenadier battalion was isolated at Luoke, when all other formations had either fallen back or been driven away to the west. In bitter fighting, the Panzergrenadiers fought their way back to Plunge. Just east of the old Reich frontier lay the East Prussian Defence Position, constructed with such fanfare earlier in the autumn by Knuth’s labour squads. In places, it was a formidable barrier, but only if it were adequately manned. Behind this, a second line of defences had been constructed around Memel itself, following the River Minge for much of its length. It was imperative that the retreating troops hold one or other of these two positions – if they failed, the defence of the city would be right on its outskirts.